Meloni's online features several of our trademark specialties. These delicious homemade entrees have become family favorites over the past twelve years. Our oven ready and prepared meals are entirely homemade with only the freshest ingredients of the highest quality. 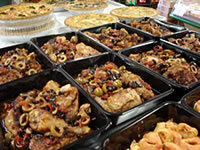 The entrees are packaged in specially designed trays that are safe for use in both conventional ovens and microwaves. Meloni's knows that in today's fast paced world cooking takes a back seat. That is why we offer the convenience of having hearty homemade meals that are ready within minutes. Meloni's online is a great opportunity for new customers to experience the taste and quality that our customers have known since 1938! Copyright © 2018 Meloni's. All rights reserved.